John Thomas Ellison war born at Parramatta 15th July 1841. His grandfather, also John, was transported to Australia in 1791 on the Albermarle and became the publican of the 'Bird In Hand' (1817) and the 'Jolly Sailor' in Parramatta. His son Thomas continued in the trade and owned the 'Native Lass' on Lapstone Hill and the 'Toll Bar' Inn at Linden. 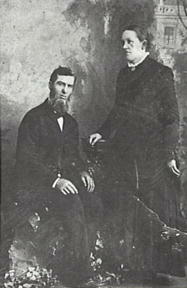 He married Elizabeth Huff in 1840 at St John's Church Parramatta and John Thomas was their first child. John lived with his parents at Toll Bar Inn was demolished for railway purposes in 1863, they moved to the 'Arms of Australia' in Emu (present day Emu Plains) and the 'Union Inn' Penrith. He married Hannah Lees, daughter of Cornelius and Henrietta Lees of Springwood in 1871. They had ten children: Beckie, Albert, Thomas, Lizzie, Ivy, Leslie, Lilly, Cecil, Sarah and Hannah, Henrietta. After marriage John purchased land and established an orchard on Hawkesbury Road Springwood, which is the site of the present day Springwood Golf Club. It is believed that a pear tree still growing near the professionals' shop was planted in the time of Ellison. The farmhouse was situated approximately where the present clubhouse now stands and was reputed to have been constructed of stone salvaged from the Toll Bar Inn Linden. He established a sizeable orchard, growing oranges and summer fruits. When the nearby Lawson estate was advertised for sale in 1890 it was said to be close to desirable properties including Mr. J.T. Ellison's famous orangery and stone fruit orchard.